What started out as endless hours of summer fun with family and friends is quickly coming to an end with the close of another pool season. In fact, if you live in a seasonal or colder climate, you’ll probably be closing your pool in the next few weeks. For many, closing a pool is as easy as throwing on a cover and calling it a day. But winterizing your above ground pool is one of the most important things you can do to help maintain your investment. If you take the time to do it right, you can protect your pool from unnecessary freeze damage as well as save yourself a lot of unnecessary work next season. When done poorly, it could delay the opening of your pool next spring at best and at worst, could cost you some serious money in repairs. Follow these steps and come springtime you will have a pool that is ready to use with little effort and minimal expense. You should always clean your pool thoroughly before closing it for the winter. Even if you don’t see anything on the pool walls or floor, scrub them anyway to remove unseen particles and organic debris. Let the pool sit for a day after scrubbing to allow particles to collect on the pool floor or be filtered out. Then vacuum the pool to remove all debris from the floor of the pool. Basically, you want the pool to be as clean as possible because you will be adding pool chemicals and any remaining organic materials in the water will throw off the chemical balance over the course of the winter. We also recommend that you clean and dry the cover to remove any mold or mildew that may have accumulated from sitting all summer long. By balancing your water chemistry — pH, total alkalinity and Calcium hardness — you are protecting the surface of the above ground pool from harmful staining and etching conditions. Next, we recommend chemically treating the pool water by adding a winterizing pool chemical kit. 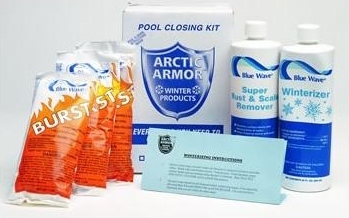 Prepackaged pool winterizing kits come with everything you need to close your in ground or above ground pool, including a pool shock chemical, a time-release chemical floater, a stain elimination chemical, an algaecide, and a separate chemical specialized in removing oils from the pool water. Winterizing pool chemicals can be added either before draining but prior to placing on the pool cover. Obviously, the more water remaining in the pool, the more pool chemicals you'll need. Be sure to follow the manufacturer's instructions for the chemical closing kit. Now that the water has been treated, it is time to drain your pool. An above ground pool should be drained to about 6 inches below the return lines and the skimmer to avoid damage to the plastic skimmer components caused by freezing water. Be careful, draining too much water will decrease the amount of pressure against the pool walls and could lead to the wall partially collapsing. How far you lower the level will depend on your type of pool and pool cover. Complete draining is not recommended unless you are prepared to spend a great deal of time refilling your pool next spring. Protecting your pool’s plumbing system from freeze damage may be your most important goal when winterizing your pool. Begin by removing all plugs on the pump, filter and any other equipment. After the pump has been drained, disconnect the lines on the filter coming from the pump. With the filter now free, it can be removed and should be drained thoroughly and stored indoors if possible to avoid fabric deterioration. You can use a high-powered wet/dry shop vac to completely drain the pump, hosing, and blow out any remaining water from the return lines. If possible, the pump should also be removed and stored inside to protect it for the winter. After you have vacuumed as much water out of the lines as possible, you can protect the plumbing with nontoxic antifreeze — never use automotive antifreeze; it can damage your pool equipment. And remember, antifreeze should go into the plumbing lines not into the pool. Last but by no means least is the all-important winter pool cover. Pool covers are a crucial element when it comes to protecting your pool during the winter months. Whether it’s an above ground or in ground pool, winter pool coverskeep the pool free of debris, prevent most algae growth and help retain heat, chemicals, and water levels. 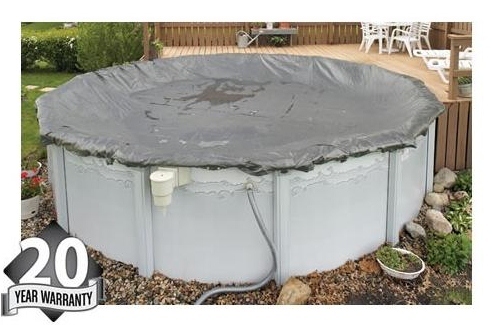 There are a variety of above ground and in ground pool covers available, each serving a slightly different purpose. From solar covers to track-style, from mesh covers to solid covers, your decision should be based on your needs and what your budget will allow. For pool owners in northern climates where cold temperatures are common, we recommend using three or four air pillows. These will elevate the cover creating a small dome so that water and debris do not puddle on top of the cover. The air pillow will also help break up any ice that may form on top of the pool cover. During the winter months you will still need to check on the pool, so be vigilant and conduct occasional inspections to make sure rain and snow have not caused the water level to rise or put too much pressure on the cover. Also check to see that the winterizing chemicals are still doing their job. While this is a very broad overview intended to help you close your above ground pool for the season, if you follow these simple steps you will not only protect your pool from potential damage, you'll simplify the opening of your pool next spring.